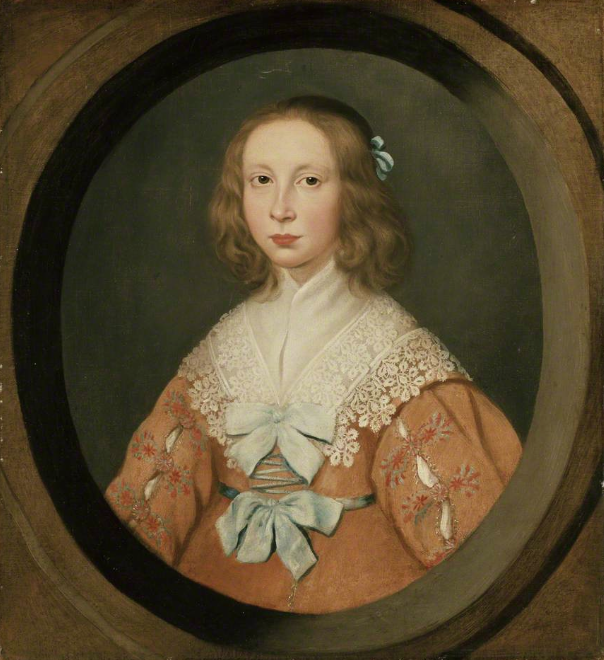 Engraved by William Marshall sometime between 1640 and 1648, Bathsua, once described as England’s most learned lady was skilled in several languages,wrote books and at one time as the caption suggests, was tutor to Charles I’s daughter Elizabeth. Bathsua wears her hair uncovered, but well dressed and has a front lacing bodice and plain, undecorated neckerchief and cuffs. Very much the educated, well dressed lady. of the Hogfaced Gentlewoman called Mistress Tannakin Skinker. 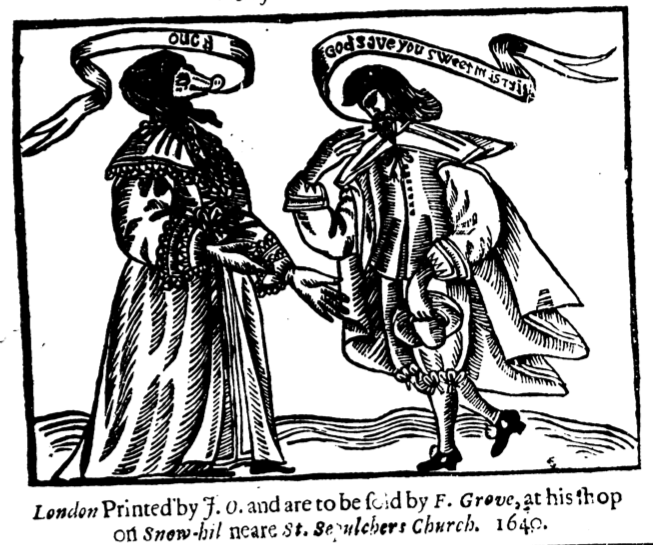 Printed in London in 1640. Miss Skinker came from the Low Countries and her mother had been bewitched before she was born. A sad tale, but the gentleman wears a rather smart doublet and breeches with ribbons decorating the leg openings all topped by a voluminous cloak. 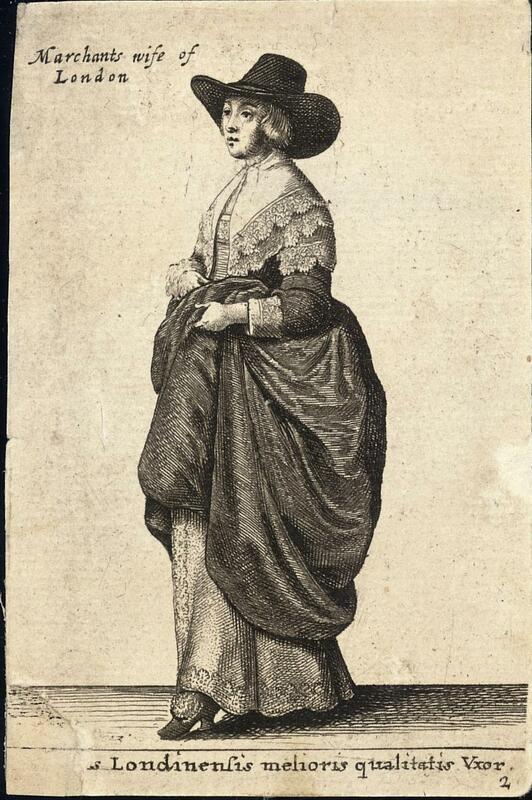 The gentlewoman herself in a gown over a petticote and a chaperone hood. The thing about this image is comparing it with the second picture which is obviously a reuse of the plate, with the head and shoulders rather crudely replaced. The Welshman’s Compliments or the true manner how Skinkin Wooed his sweetheart Maudlin after his return from Kenton Battaile. 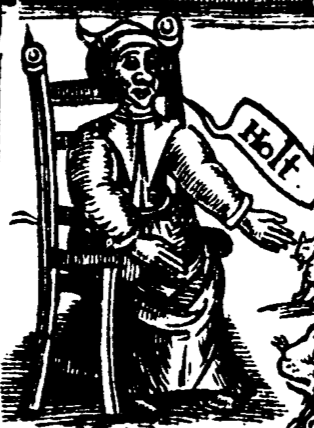 This one printed in 1642. March 4th to be precise. A 17th century spot the difference. Even his name is similar! 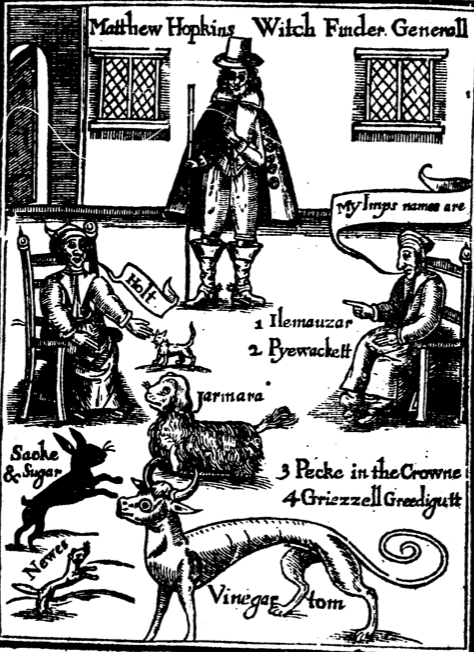 From The Discovery of Witches, published by Matthew Hopkins in 1647 “For the Benefit of the Whole KINGDOM” Hopkins made his money and reputation out of terrorising the old and vulnerable. He even got local people to do the hard work for him so he didn’t have to stay up all night watching for familiars. Nice man. 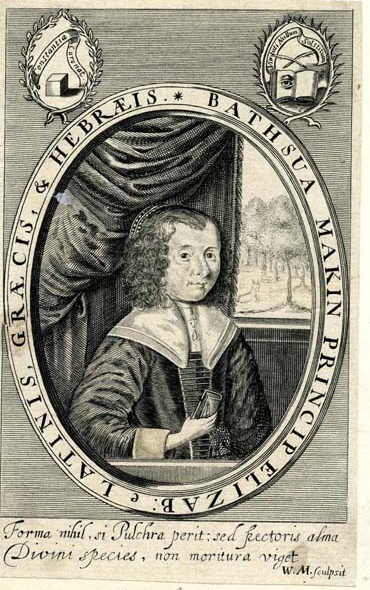 Hopkins is wearing a short tabbed doublet which would have been pretty low fashion by 1647. He did live in a backwater of the country though. I know, I live there today! He found several “witches” in my village. 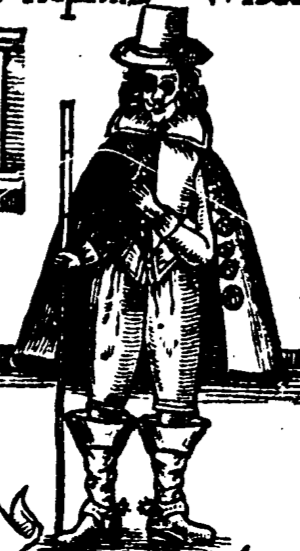 The stiff standing collar is also very old hat, though I believe this woodcut must have been made for the publication. This old woman seems to be sporting one of those odd pointy coifs on her head with a smallish neckerchief, bodice and petticote. or Room for a Ram Head. 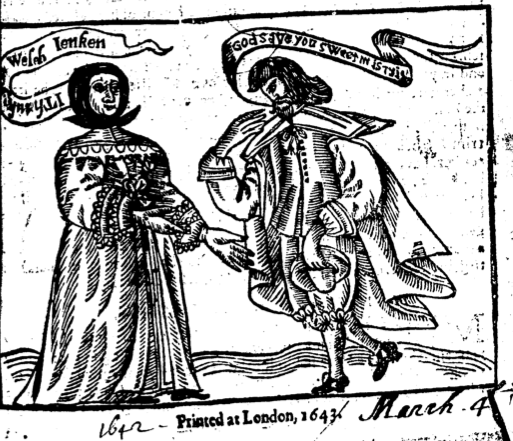 Witty pamphlet published in 1642 of a discourse between a wife and her philandering husband. Some nice basic costume details here. Clearly shown are the shape of the woman’s bodice and skirt, the man’s doublet and breeches as well as their linen. 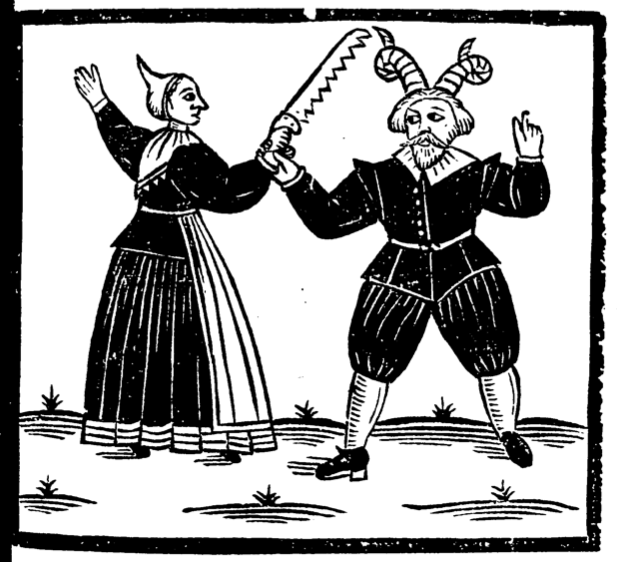 The wife wears a strange pointed style coif which does appear in several other woodcuts of the time.